Saturday 13th January saw the rescheduling of the Mighty Oaks Cross Country event that was cancelled on 9th December due to snow. This race, hosted by Acorns AC is well known for the energy sapping Acorns Hill, which runners had to ascend on each lap. The recent heavy rain meant that the saturated course was quickly churned into an energy sapping quagmire. The mens’ four mile, four lap race was dominated by Mark McKinstry (North Belfast Harriers). Mark, who had represented Northern Ireland at last weekend’s Antrim International XC enjoyed a relatively comfortable win, despite the efforts of a talented chase pack, claiming victory in 24.45. In the battle for second place it was City of Derry AC’s Alan Bogle and Noel Logan who were left to contest the other podium places. At the end of a very close contest it was Alan who finished second in 25.17 with Noel third, just two seconds behind in 25.19. Situated between Cookstown and Omagh, An Cregan was the venue on Saturday 13th January for event 3 in the popular Sperrin Harriers Winter Trail Series. This 5 mile race consisted of two scenic laps of the forest tracks before finishing at the centres reception buildings. In the mens race the first five finishers were Jason Wilson (Ballymena Runners AC) 29.00, Matthew Neill (Omagh Harriers) 29.14, Conor Maguire (Omagh Harriers) 29.29, Brian Taggart (Sperrin Harriers) 29.55 and Pete Neill(Omagh Harriers) 30.08. 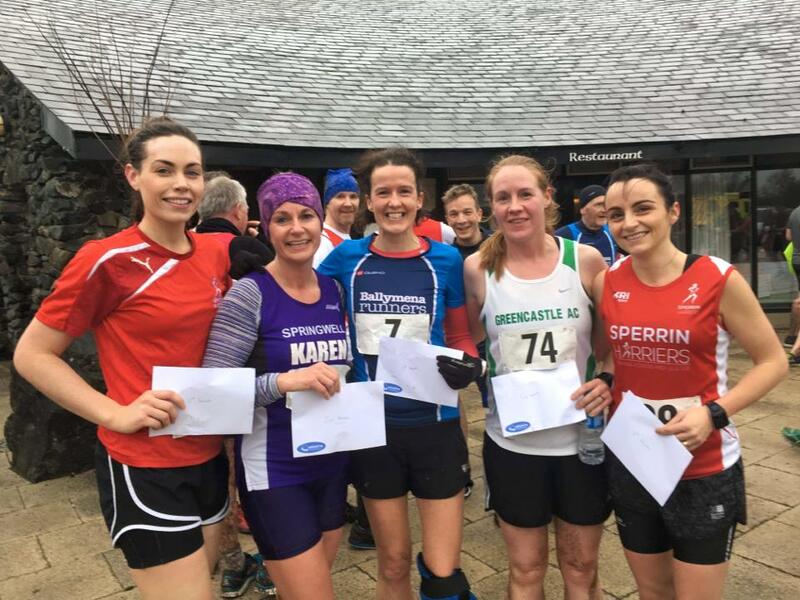 In the ladies Gillian Wasson (Ballymena Runners AC), having already won the Race Over the Glens on New Year’s Day, continued her excellent form winning in 33.28, Karen McLaughlin (Springwell Running Club) replicated her second place of 2017 with a time of 35.03 before Olivia Mullin (Greencastle AC) 35.06, Amanda Donnelly (Sperrin Harriers) 36.09 and Laura Mitchell (Sperrin Harriers) 36.11 completed the top five ladies. Springwell RC’s Jim Breen continued his return from injury with an excellent run of 38.42 to finish as second M60. The Athletics NI Sprints and Hurdles Indoor Championships were held on Saturday 13th January. Springwell RC were represented in the U16 Girls 60m sprint by Tolu Jide-Ojo who had an excellent run of 8.36 to claim victory. Saturday 13th January (13/1) was World Half Marathon Day with the East Antrim Marathon series celebrating the event by running a Marathon. Springwell RC’s Helena Dornan, a regular figure at these events had an excellent run to finish as second lady in 3.55.09.